Charles Gibson:Joan had an opportunity to talk with one of the more mysterious recording artists on the hit charts these days. Everyone thinks it's a group, but it's a single woman, known simply as "Enya". 'Orinoco Flow' video begins playing, and Joan Lunden begins to speak over it. Joan Lunden: Her music has been called "a cathedral of sound that sweeps over the listener". And in spite of a musical climate characterized by high decibels, the ethereal compositions of the Irish singer/songwriter named Enya have become international bestsellers. She now has a follow-up to her breakthrough single 'Orinoco Flow (Sail Away)'. It is from this new album, Shepherd Moons and it's called 'Caribbean Blue'. And, true to form, it is a treat for the eye as well as the ear. 'Caribbean Blue' video clip is shown. Lunden begins speaking again and music fades out. 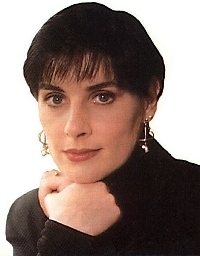 Interestingly, Enya herself has remained kind of as mysterious as her music. This is her first network television interview, right? Joan Lunden: So, we're very, very, pleased to have you here. This is not mainstream music (Enya laughs) and I, this is interesting, because I looked it up. Now, your last album Watermark has sold over 4 million copies worldwide. I think it's still, what, uh... on the charts after, what, 148 weeks or something like that. The new album is number 1 on the New Age Charts and critics would say that it would be unlikely that a different kind of music like that would... have that much popularity and be able to sell that many records, so did that surprise you? Enya: Oh, very much so. When you work on a project, and it's very dear to you, that's the first thought you have. But, after you finish, you wonder "is anybody going to listen to it? ", because I was very aware that this was very different to what was happening musically. So, I was thrilled. Enya: Its, um, it's a way that we've developed, this sound, and there's no easy way except for standing in front of a microphone for maybe 5 hours [Joan whistles in amazement] singing the same part over and over, but it's very magical, it's very hypnotic, and I get so involved in the music that it becomes very much a part of it. Joan Lunden: You have? How many times? Enya: On one song, 500. Joan Lunden: (amazed)500 times over? Joan Lunden: Have you ever done a couple hundred and then listened to it back and said, "Hmmm... I don't know."? Joan Lunden: Can it be translated, ah, I mean, would you want to go out on tour? Enya: Oh yes. I was on the stage before, and it's something I miss. Ah, the direct contact with the public is something that I miss so much with this, but, um, it's not possible to take the music as it stands because I have performed all the music and all those overdubs. But I think it's possible to take, um, the emotions, the melodies, those feelings and arrange it with the stage in mind. Joan Lunden: (cutting her off at the end) With a big orchestra? A big orchestra behind you? Joan Lunden: You grew up in Ireland, and many have said that the Irish folksongs... that there's an influence there in your songs. Joan Lunden: Yes? Did you realize that as you started, though? Your music? Footage of Enya walking along the Irish seashore is shown onscreen. Enya: Well, I was brought up in the northwest of Ireland, and in a small area called Gweedore; and I was brought up speaking Gaelic as my first language. And in this area, the Irish traditional music is very, very strong, and so it plays a very strong influence in my composing. Joan Lunden: And, correct me if I'm wrong, aren't... don't you do Gaelic and, I think, even Latin in some of your songs, right? Enya: Mmm hmmm. The Latin, um, I like to sing in Latin because of the sound, being brought up a Catholic and singing hymns in church. And, I love hymns, and this is another influence in my music. Joan Lunden: Well, a lot of people would like to see you go out on tour. So, see if you can figure out a way to do that. Right now, though, they can listen to your album. It's called Shepherd Moons. Nice to meet you. Thank you for making this your first national interview. Joan Lunden: It's nice of you, and Good Morning, America continues in just a moment. Note: Transcribed by Ryan Lingsweiler and posted to the Enya Mailing List on 26 March 1995. It's believed the interview aired shortly after the release of Shepherd Moons.